Cream butter and sift in the confectioners sugar and cocoa powder. Add the milk and vanilla. Mix untill well incorporated. Second Attempt: I set the temperature to 200 for 10 minutes. 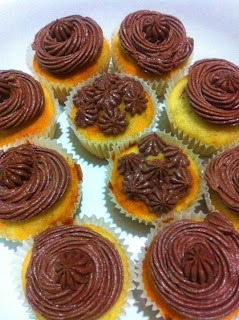 And this is the result... Heehee! Sunog!! heehee! 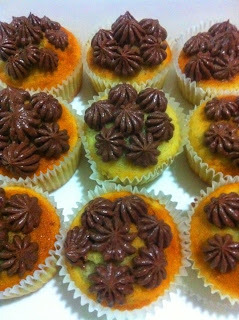 I'm using a turbo broiler for baking cookies and cupcakes. 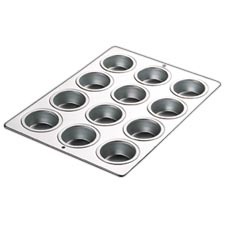 A regular size muffin pan like this won't fit my turbo broiler.What I use for cupcakes are these individual stainless muffin pans and silicone muffin pans. 7 pcs of these pans will fit in the turbo broiler 9 pcs of these silicone pans will fit in the turbo broiler NOTE: 150 degrees, baking time 10-12 minutes. non-stick round pan - 8 x 1 1/2 inches NOTE: 150 degrees, baking time 10-11 minutes. make it 15 minutes if you want it to be more crunchier. For Banana Bread: What I use is a non-stick loaf pan - 8 x 4 x 2 1/2 in. NOTE: Temperature must be - 140 Degrees for 20 minutes. ***Always remember: Turbo broiler or convection oven circulates heated air using a fan. 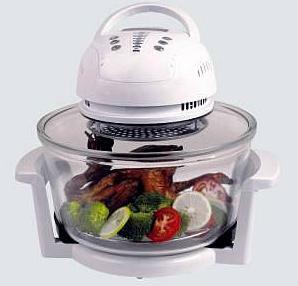 This not only prevents overheating of food but also helps warm the food faster than the conventional oven. 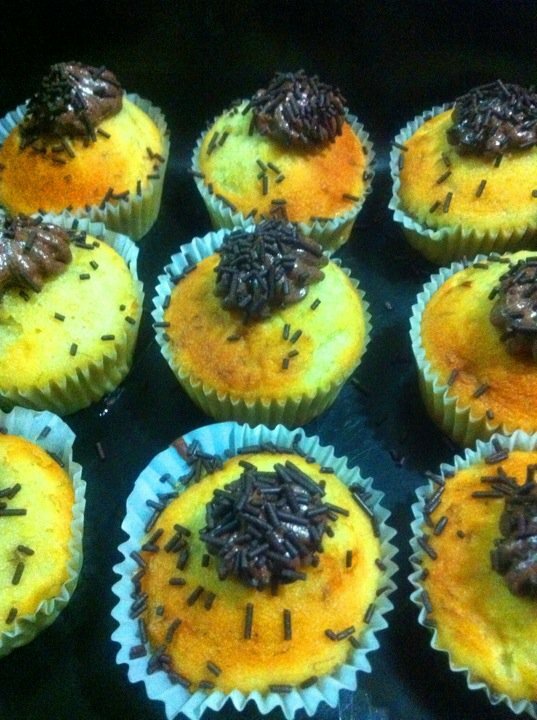 In baking, we need to lower the temperature for even results. Turbo Chicken hmmmm, beautiful! ^^ Isn't it? Preparation Give the chicken a good rubdown with it, taking care to massage it inside and out. Marinade the Chicken with Soy sauce, salt and Calamondin for 10-20 minutes each side. Place a small baking pan at the bottom of the turbo broiler, this will be used to catch the drippings (don't throw this after the chicken is cooked! You can use it to make gravy, or see the explanation below). 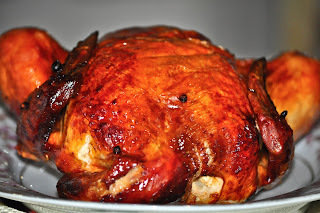 Place the chicken in a turbo broiler with the temperature of 250 degrees for 30 minutes. Turn over the chicken and cook it for another 10 minutes. It should be nicely crisp and golden brown after 40 minutes.